Athelstan George was commissioned in 1907 and had previously served in India. He was killed a month after the start of the First World War. Athelstan Key Durancé George was born on 25 March 1887 at Beverstone House, Brixton Hill in south London, the youngest child of Arthur Durancé George (1848–1921) and his wife, Charlotte Ada née Key (1847–1921). Arthur Durancé George was born in Romsey, Hampshire, the son of Josiah George (1808–1862), a brewer who, like his father Josiah (1784–1860), had been mayor of Romsey on several occasions. The name Durancé derives from the brother of Josiah George junior, John Durancé George (1815–1851), who had been dentist to London society, including the Dowager Queen Adelaide. Arthur was employed by the National Provincial Bank throughout his working life. At the 1871 census, he was living in Stafford where he was employed as a ‘bank accountant’. Later that year, he moved to Ipswich where he appears to have been based until about 1888, when he moved to Carisbrooke on the Isle of Wight to manage the Newport branch. His final career move came in about 1892, when he moved to Bournemouth. At the time of the 1881 census, he was described as a ‘bank inspector’, lodging at 17 Brixton Rise, south London, the home of Jonathan Muckleston Key (1806–1888), a widowed wealthy property owner, and his children, including his 33-year old unmarried daughter, Charlotte. Arthur and Charlotte were married at St Matthew’s church, Brixton on 2 June 1881. At the time of the marriage, Arthur was shown as living at Crickhowell in Breconshire, mid-Wales. The couple’s first child, Alice Hilda, was born in Brixton in the summer of 1882, followed by Arthur Swynfen two years later and their last child, Athelstan Key, who was born at Beverstone House, the home of Jonathan Muckleston Key, on 25 March 1887. All three children had been given the third name, Durancé. Athelstan was baptised at Christ Church, Streatham Hill on 7 August 1887. On the baptism records, the family address is shown as 13 Killieser Avenue in the newly built Telford Park estate at Streatham Hill, about 1½ miles south of Beverstone House. The following year, the family moved to Carisbrooke on the Isle of Wight, where they lived at Clatterford House. In 1902, Arthur was appointed as the Bournemouth Borough Treasurer. 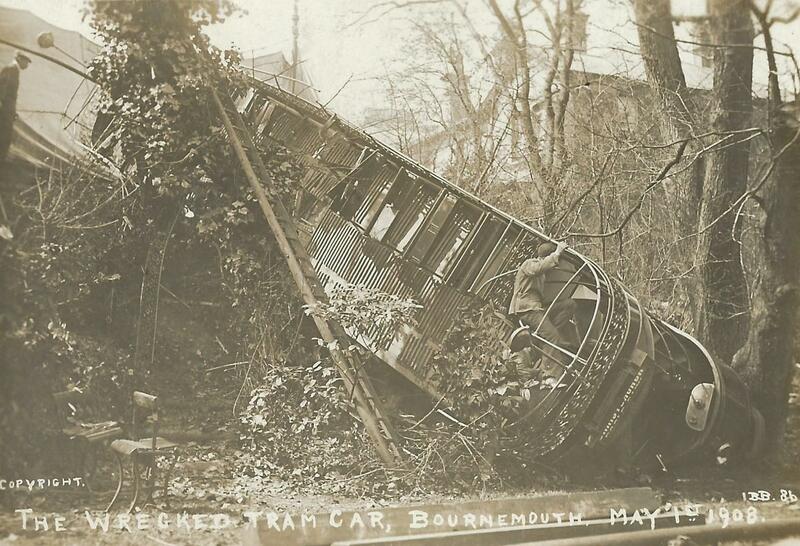 In May 1908, he was a passenger on a tram which ran out of control descending Poole Hill and crashed in Avenue Road, killing seven passengers and seriously injuring several more. Fortunately, Arthur escaped with only minor injuries and shock. By the 1911 census, Arthur and Charlotte were living at ‘Alderholt’, Clarendon Road, Bournemouth, diagonally opposite their previous home. Athelstan received his early education at Hailey School in Poole Road, Westbourne, before going to Tonbridge School, aged 12½, in January 1900. At Tonbridge, he was a member of Ferox Hall and in 1905, he represented the school in fencing and with the sabre. He also won the Headmaster’s Drawing Prize. Athelstan left Tonbridge in 1905, and went up to Caius College, Cambridge, where be rowed in the College Eight. At Cambridge, he studied medicine but found the work involved ‘uncongenial’. He left the university after his first year, and studied for the Army Examination. 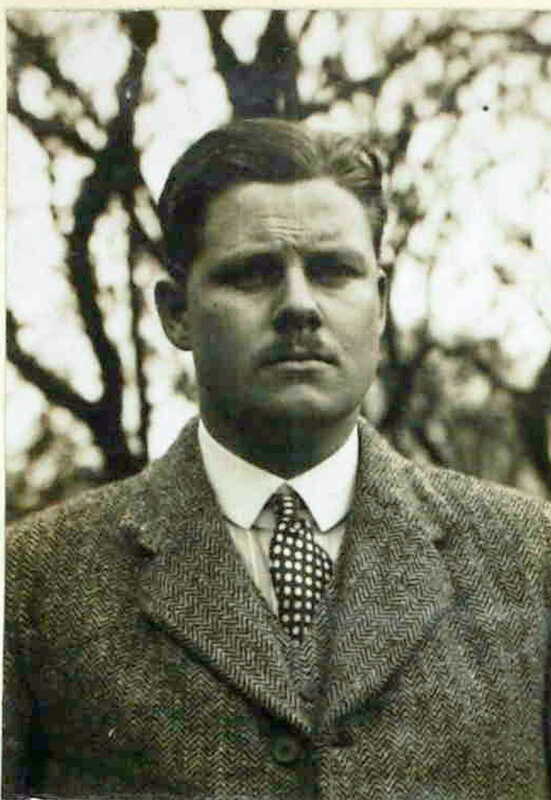 In May 1914, Athelstan became engaged to marry Marjorie Phyllis Greenway (1892–1983), the daughter of Charles Greenway (1857–1934), a wealthy businessman from Romsey, who in 1927 was raised to the peerage as Baron Greenway, of Stanbridge Earls in the County of Southampton. Athelstan’s father, Arthur was initiated into The Staffordshire Knot Lodge No 726 at Stafford in June 1870. As his career took him around the country he joined other local lodges, each time resigning his previous lodge membership. Thus, he joined British Union Lodge No 114 at Ipswich in November 1871 where he remained a member until joining Lodge of Albany No 151 at Newport, Isle of Wight in July 1888, and finally Horsa Lodge No 2208 at Bournemouth in December 1893. 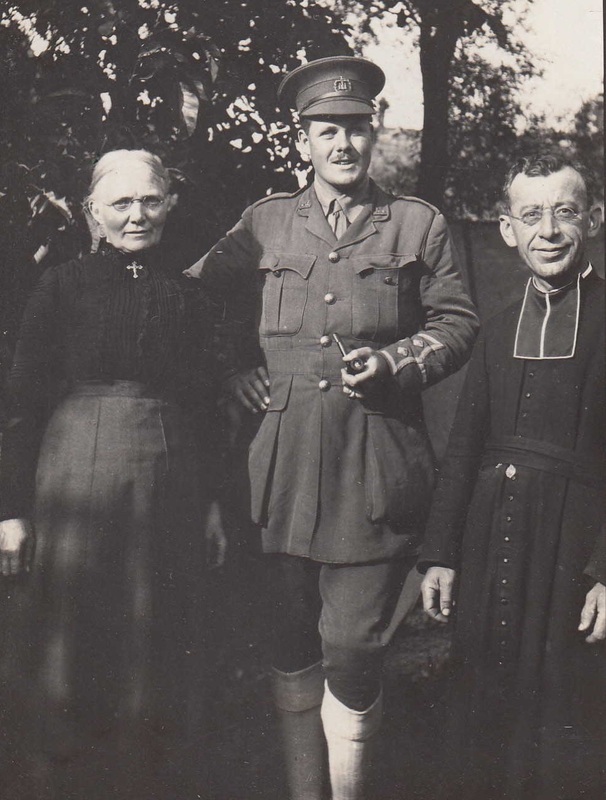 While serving with the army in India, Athelstan was initiated on 8 July 1912 into the Lodge of Faith, Hope & Charity No 1285 at the hill station at Ootacamund (‘Ooty’). He was passed to the second degree on 12 August, and raised on 9 September 1912. On 1 February 1907, Athelstan was gazetted as 2nd Lieutenant in the 4th Battalion, The King’s Regiment (Liverpool), a reserve infantry battalion. His colonel later described him as the best subaltern he had ever had. On 9 June 1909, he transferred to 2nd Battalion, The Dorsetshire Regiment, based in India, and was promoted to Lieutenant on 26 May 1910. On 18 May 1912, he was appointed A.D.C. to Sir Murray Hammick, Governor of Madras. After Hammick’s replacement in October 1912, Athelstan became A.D.C. to George Clarke (later 1st Baron Sydenham of Combe), Governor of Bombay, until Clarke’s retirement in April 1913. His ‘irrepressible good humour, tact and power of organisation’ made him extremely useful and popular in India. He was also a good shot, an accomplished swordsman and a capable boxer. He returned home in the summer of 1913 and transferred to the 1st Battalion, The Dorsetshire Regiment, quartered in Belfast. On 3 April 1914, he gained his aviators’ certificate, flying a Bristol biplane at the Bristol Aviation School on Salisbury Plain. He also undertook a course of Signalling, which he passed with distinction. When Britain entered the war on 4 August 1914, the 1st Battalion, The Dorsetshire Regiment was stationed at Victoria Barracks, Belfast, under the command of Lt. Col. Louis Bols, D.S.O. The battalion, part of 15th Brigade, 5th Division (in turn, part of the British Expeditionary Force) was quickly mobilised and, on 14 August, sailed from Belfast on board the SS Antony, a 6,400 tonne passenger liner of the Booth Line built in 1906. After an easy passage, they disembarked at Le Havre on Sunday 16 August, from where they travelled by train to Le Cateau, arriving in the evening of 18 August, from where they marched to their billets at Ors, 7km to the east of the town. The Dorsetshire Regiment then retreated in the face of the German advance, and despite making a brief stand at Le Cateau on 26 August, by 31 August they had reached Crépy-en-Valois, 175km from Mons, where they were engaged in a brief rearguard action with the enemy. They then continued their retreat until 5 September, when they finally reached the hamlet of Gagny, south of Tournan-en-Brie (40km east of Paris), where they were billeted in the stables of the Château du Monceau. The Dorsets had retreated over 260km from Mons, in ten days, often in very hot weather, finishing in a night march to reach Gagny at 8.00am. What had happened, or why we were suddenly to turn against the enemy after ten days of retreat, we could not conceive; but the fact was there, and the difference in the spirits of the men was enormous. They marched twice as well, whistling and singing, back through Tournan (en-Brie) and on to Villeneuve (le-Comte). The Dorsets started their march at 5am on Sunday 6 September and, by the end of the day, had reached La Celle-sur-Morin. During the night, they heard heavy firing to their right, but did not engage the enemy. Despite several requests for orders, it was not until 12.45pm that they were again on the move. By 3pm, they had reached Mouroux, where they came under shell fire and were ordered to halt. After an hour’s delay, they moved on via Coulommiers, to Boissy-le-Châtel where they bivouacked for the night, before turning north the following day and marching 14km to Charnesseuil, to the east of La Ferté-sous-Jouarre. On Wednesday 9 September, the Dorsets were in the rear of the advance when they crossed the River Marne at Méry, where they halted once again, with the sound of heavy gunfire to their front. At this point, the Marne meandered between steep hillsides which climb sharply through farmland up to heavily wooded hilltops. By 12 noon, the head of the brigade was crossing open land when they came under heavy shell fire from a German battery situated on point 189, at Les Maillons, near Montreuil-aux-Lions. The battery had been reported as deserted but the battalion war diary reports that it ‘continued to cause considerable loss throughout the day’. At 1pm on 9 September, the 1st Battalion were at Le Limon where they had taken cover when their C.O., Lt. Col. Bols offered to attack the German battery. With D Company (in which Athelstan was a platoon commander) on the left and C Company on the right, and A Company and the Machine Gun Company in reserve, the battalion advanced until they reached the road between Pisseloup and Bezu (the present day D16) at about 2.20pm. At this point, Lt. Col. Bols sent a message to 15th Brigade HQ: ‘I shall attack shortly. What artillery support may I expect?’ No reply was received, but the Dorsets pressed on towards their objective, as B Company started to edge its way around the west of Bois des Essertis. At 3pm, the Dorsets came under attack from the enemy who had been hiding in the woods who opened fire with machine guns and rifles, as well as shellfire raining down from the battery above. The Dorsets were immediately pinned down, but still tried to move forward under withering fire and return it as best they could. D Company was pinned down in open fields, with machine gun fire sweeping their attack lines. 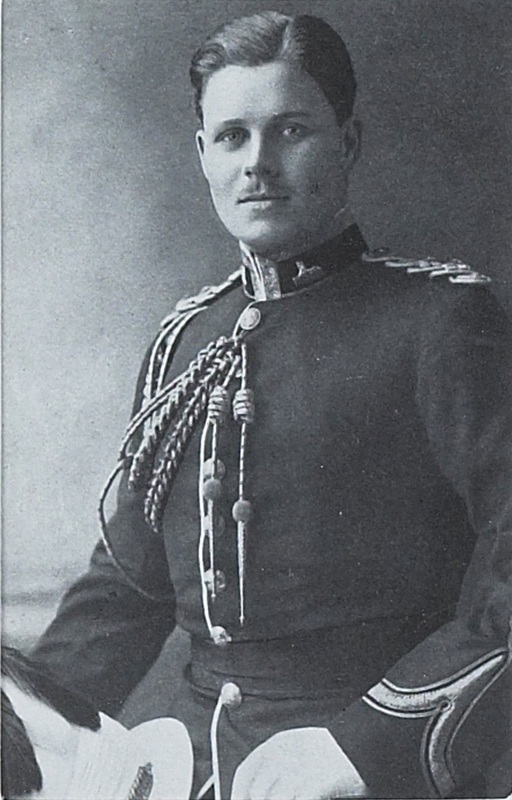 Just after 4pm, Lieutenant Athelstan Key Durancé George was shot in the head when he raised himself to look through field glasses. * since died of wounds. Rather strangely, the diary does not record the subsequent death of Athelstan George. From the dressing station, Athelstan was taken to the field hospital at Coulommiers where he died on 14 September, without regaining consciousness. I am glad that you have written to me as I have often wished to tell his friends and relatives how deeply every officer and man of the Dorsets grieved with you at the loss of your dear son. During the period which followed our fights on the Marne there was, however, little time to write or even to think. Then came the rush northwards and the great fight of the Battalion at Givenchy, when we lost three-quarters of our men and all but four of our original officers, and then I had to spend ten weeks in England, recovering from wounds. I first met your son about last May, when he returned to Belfast after going through a course of flying, and I think that a month later he returned to England to begin a course of signalling, from which he returned just before mobilisation, so that I did not get to know him well till the beginning of the war. During those first six weeks he was—I think there is only one word to describe him—magnificent. Always cheerful; always caring for others; watching over his men no matter how weary; never sparing himself. To my mind he was the ideal of a British officer—gallant and brave, of course, but in addition, tireless in helping others who did not possess his powers of mind and body. I fear that this is but a poor sketch to give you of one who earned our love and esteem to so great a degree. I know his memory will live long in the Dorsets. In their tribute to the men from the college who were killed in the war, Caius College state, rather oddly: ‘Athelstan George was shot by a sniper whilst training men in the trenches to keep their heads down’. Athelstan George was buried at Coulommiers Communal Cemetery in grave A. 1. The Commonwealth War Graves Commission database incorrectly records him as ‘Athelstan Key Durrance George’. On Sunday, 14 November 1915, a memorial tablet was unveiled in the Church of Saints Mary & Ethelflaeda at Romsey Abbey in a ceremony attended by Athelstan’s parents and family. Made of pure Carrera marble, the tablet has a crest in each of the top corners, one of the Dorsetshire Regiment and the other the family crest. Along the bottom is a carved officer’s sword entwined in branches of leaves and berries. It bears the motto: ‘Greater love hath no man than this, that a man lay down his life for his friends’. 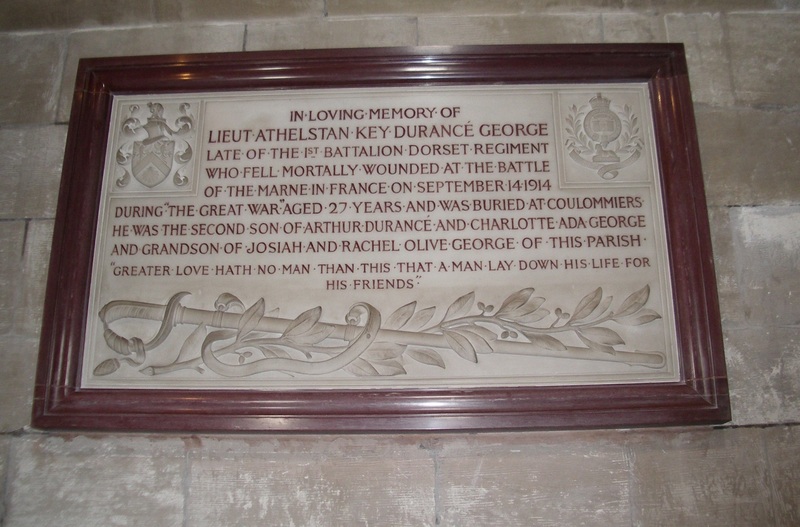 As well as the memorial in the Romsey Abbey church, Athelstan George is commemorated on the war memorial at Lyndhurst, although it is not clear what connection he or his family had with that parish, and on the Hailey School Roll of Honour held in Bournemouth Library. 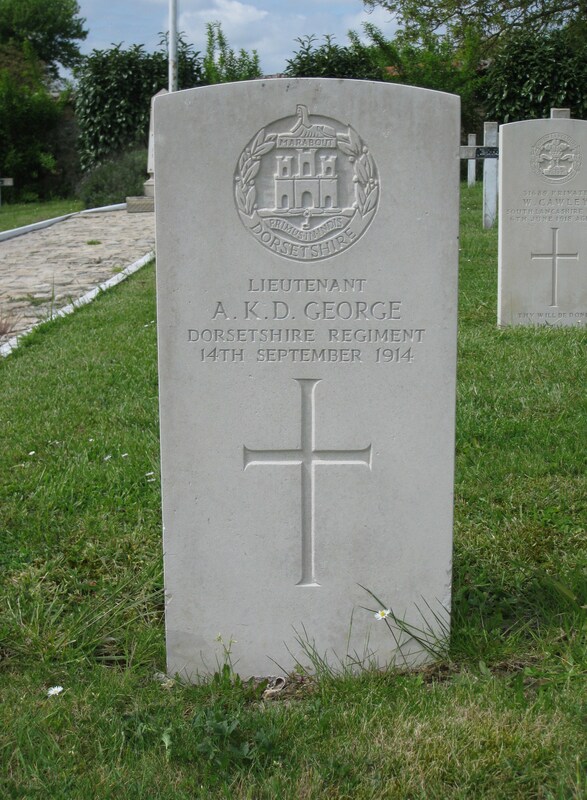 Arthur Durancé George resigned from Horsa Lodge on 21 September 1914, a week after Athelstan’s death. Arthur and Charlotte both died in the summer of 1921. 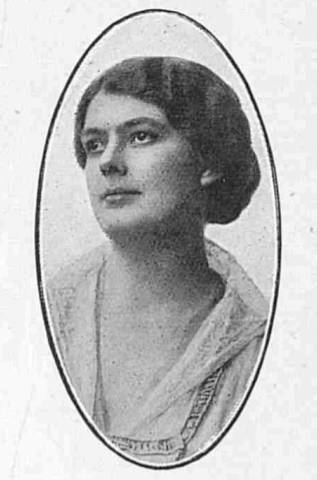 Athelstan’s fiancée, Marjorie Greenway married Lt. Col. John Brown Dalzell Hunter in November 1915; the couple had a daughter, Phyllis, who died in 2005. Arthur Swynfen George joined the Royal Navy as a 16-year old in October 1900 and by the start of the war had been promoted to Lieutenant. He seemed plagued by health issues, but was in command of HMS Saracen in 1915. From June 1916, he was gunnery officer on board HMS Grafton and saw service in the Mediterranean. He was promoted to Commander in June 1919 and retired from active service in August 1922. During the Second World War, he was a consular shipping adviser, based at Sheerness. He died in November 1940, aged 56, from heart failure and broncho-pneumonia. Alice Hilda George married Dr. Maitland Bodley Scott in 1904. They had five children, including (Sir) Ronald Bodley Scott, who became physician to Queen Elizabeth II in 1952. In June 2014, the Forces War Records website claimed to have identified the men who were the inspiration for the characters in the Blackadder Goes Forth comedy TV series originally broadcast in 1989. According to their ‘research’, Athelstan George was the real-life soldier on which the amiable but inept Lieutenant George (portrayed by Hugh Laurie) was based. This story subsequently appeared in both national and local newspapers. 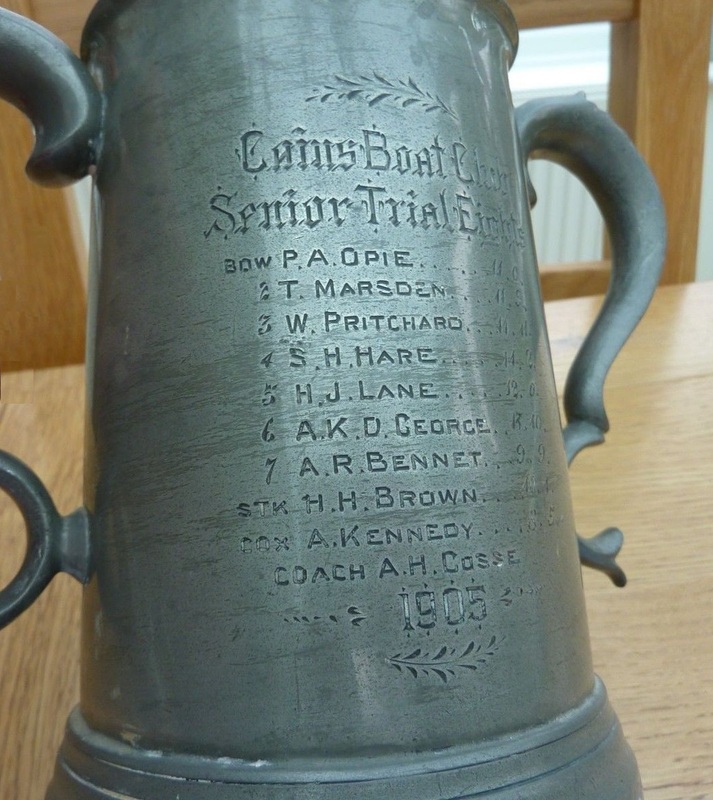 In December 2017, a large pewter tankard engraved with the names of the Cauis College Cambridge Rowing Eight of 1905, including A.K.D. George was sold on Ebay for £28.00. I am deeply indebted to Jonathan Elliman and his excellent blog, in which he pays tribute to his great-uncle Frank Crawshaw, ‘Soldier, Londoner’ (1893–1915). Elliman has summarised the war diary of the 1st Dorsetshire Battalion, incorporating extracts from the regimental history and the diary of Lord Edward Gleichen, the commanding officer of the 15th Brigade. The story starts at 14th August 1914, Belfast, Ireland: The Dorsets set sail for war and unfolds each day, until the death of A.K.D. George is recorded at 9th September 1914: The abandoned battery on Hill 189. WO 339/7322: Lieutenant Athelstan Key Durance George. 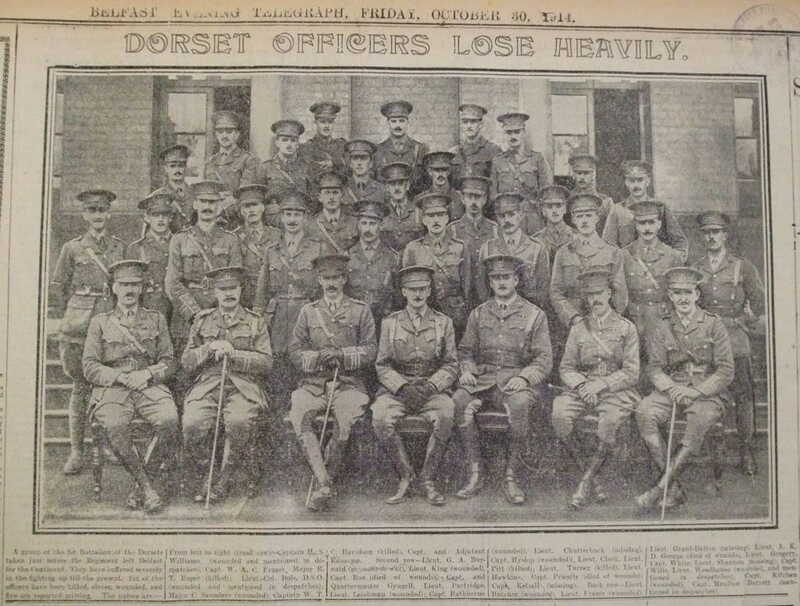 The Dorsetshire Regiment.